I can remember exactly where I was and what I was doing when the news of 9/11 attacks on the World Trade Centre Twin Towers in New York reached me. It was around 1.15 pm in the UK, a bright sunny afternoon. I was just entering London’s Kings Cross Station to buy tickets. My colleague Marietta, walking with me, received a call to her mobile phone giving the breaking news that somebody had just flown a plane into WTC. Another clumsy pilot, I thought — recalling how a B-25 Mitchell bomber aeroplane had once accidentally crashed into the Empire State Building, back in 1945. But as we soon found out, this was no accident: it was a dastardly terrorist attack by suicidal fanatics who somehow penetrated the already high aviation security arrangements. Life in London continued normally, but we were all completely distracted. I had work to do in an office, but can’t remember any of us actually focusing on our chores. Instead, we just watched the live TV coverage of unfolding events across the Atlantic with mounting horror. So did over a billion other people around the world. It was a world changing event about which much has been written and said. More reflective and less impulsive commentary on this 10th anniversary puts events and their aftermath in better perspective. Of course, we now have the benefit of hindsight. Journalism is the first rough draft of history. The reporters on duty that day were challenged to cover a breaking news event whose magnitude and historical context would become clearer only as the hours and days passed. CNN was the first to break the news live on the air, followed by the rest of the news pack. On the whole, journalists in all media rose to the enormous challenges of covering a scary, bewildering and earth-shattering story. If anyone thought (like I did, for a few minutes) that it was a terrible accident, all doubts were removed when the second plane hit. By this time, all cameras were focused on the already burning first tower. 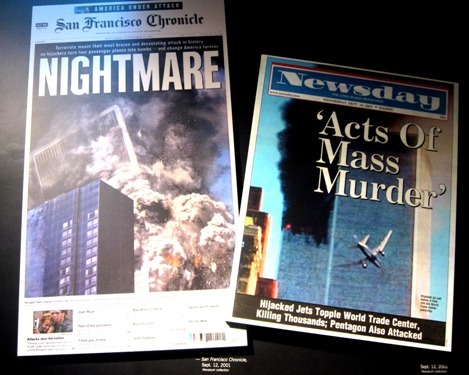 Understanding 9/11: A Television News Archive. This collection contains television news programs recorded live from around September 11, 2001 by the non-profit Television Archive to help patrons research this important part of United States history. These materials were originally available on the televisionarchive.org site from October 2001 through 2003. 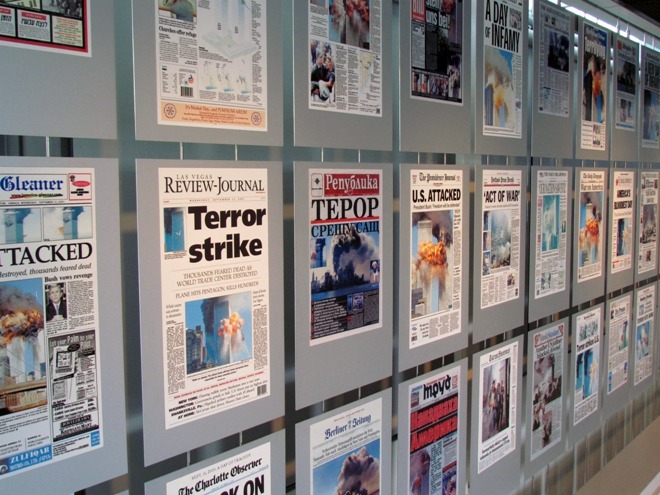 This gallery explores the horrendous events of Sept. 11, 2001, and the extraordinary challenges that faced the journalists trying to report the news to a shaken nation and world. The gallery includes a tribute to photojournalist William Biggart — a journalist who died covering the attacks — and some of the final photographs he took. Also featured are front pages from around the globe about the attacks and first-person accounts from reporters and photographers who covered the story.